Double bass tone in a thinner comfort-focused body. The Warwick RockBass Alien bass is known as the instrument that delivers both traditional acoustic bass and a double bass tone. The Deluxe Thinline features a thinner comfort-focused body. The Alien’s design which includes special bracing and an offset asymmetric soundhole allows this thin bass to deliver a big, warm tone. The Alien Deluxe Thinline 4-String is ideal for performance, recording, and other amplified playing situations thanks to its Shadow electronics. This includes the innovative Shadow Nanomagnetic pickup system. 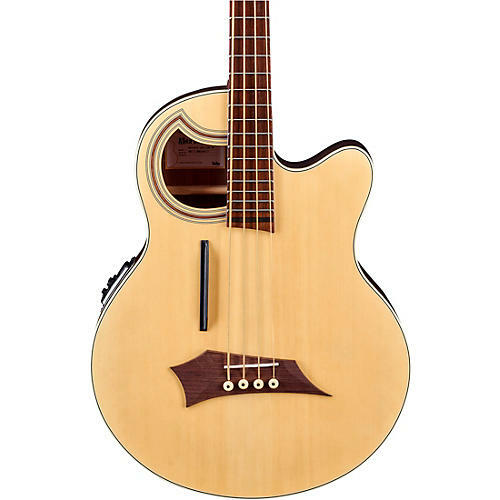 This great acoustic bass has a solid spruce top and laminated walnut back & sides. Its mahogany neck has a Wenge fingerboard with 24 extra jumbo nickel-silver frets. Play more, in more places with the RockBass Alien Deluxe Thinline 4-String. Includes gig bag. Fingerboard Radius: 508 mm / 20"
Scale length: 812 mm / 32"
Width Nut: 38,5 mm /1,5"
Width 12th fret: 54,5 mm /2,1"
String label / gauges: Warwick Red Bronze Strings: 045" - 105"